A raised bed provides a limited amount of growing space if properly placed in the landscape, but you can add more by building a trellis for your climbing plants. You can, of course, simply buy a trellis and affix it to the sides of the bed, but building your own is simple, and the flexibility of this approach allows you to adapt the design to fit your bed and overall design of your garden. A trellis doesn't have to splay upward like a wooden replica of a fountain -- although it can. A rectangular one works just as well. Add more growing space to your bed by building a trellis. Make the trellis out of the same or similar materials as the bed's frame. For example, if the frame of your bed is meticulously constructed out of redwood lumber, two-by-four or two-by-two redwood would make a sturdy trellis frame. If the construction of the bed frame is more utilitarian than aesthetic, you may appreciate the simplicity of making the frame from PVC pipes. Either way, you'll need lattice -- consider using jute twine for this; it's easier to install than wood, and it's adjustable. If you need more strength, then upgrade to one-by-two-inch lumber for the lattice. The design of your trellis doesn't have to be complicated. 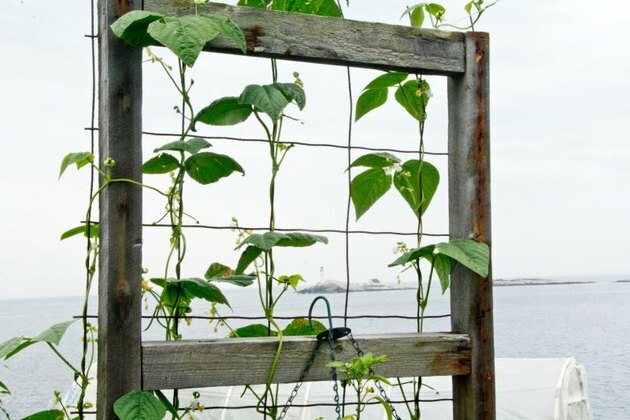 A rectangular frame, securely attached to the bed frame and intersected by a vertical lattice of twine, provides footing for beans, peas and climbing flowers. Because the twine is flexible, you can easily reach through the lattice when necessary. You can't always do this with a wood lattice, but there's nothing stopping you from using wood, if you prefer. Measure the length of the bed with a tape measure and cut two pieces of two-by-four or two-by-two lumber about a foot shorter than the bed, using a circular saw. Cut two more pieces of lumber for the vertical sides of the frame. Make the frame high enough to accommodate the plants you are growing. Generally, 6 to 8 feet is high enough -- it's best if the top of the trellis remains within your reach. Place the board that forms the top of the frame on top of the one that forms the bottom and arrange them so their ends are flush. Drill 3/8-inch holes through both of them, using a 3/8- by 12-inch drill bit. Space the holes 4 to 6 inches apart. Assemble the frame with galvanized steel corner brackets. Wind jute twine through the holes to create a vertical lattice. Thread the twine through a hole in the bottom piece, up to the corresponding hole in the top, then down through the adjacent pair of holes and tie it off to make a loop. That way, you can adjust the tension on that twine without affecting the rest of the lattice. Create a cross mesh, if desired, by drilling holes in the side pieces of the frame and threading jute through these holes. Place the bottom of the frame on the ground next to the bed and affix the trellis to the bed frame with 3-inch wood screws or galvanized corner brackets. PVC plumbing pipe isn't as attractive as redwood, but it's much lighter, and it lasts virtually forever. You can drill holes through it using the same bit you use to drill holes in wood, but to keep the pipes from turning while you're drilling, tape pairs of pipes together with duct tape and drill through both of them at once. Assemble the frame with plumbing fittings; use 90-degree elbows for the corners and a couplings when you need to join pipes in a straight line. Glue is optional -- once assembled, the structure should stay together without it. Affix the frame to the bed with pipe strapping. What Kind of Nails or Spikes for Landscaping Timber?